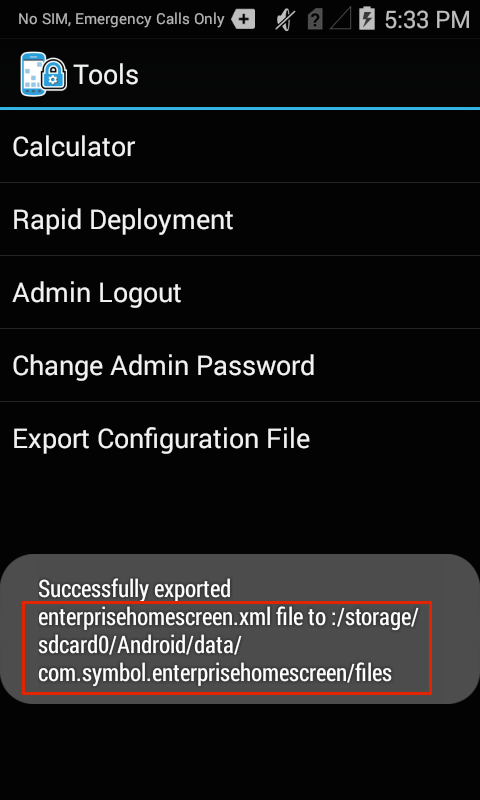 This section assumes a basic knowledge of Enterprise Home Screen and its capabilities and essential workings. For those not familiar with Zebra's free security tool for its Android devices, please see the About and Setup pages before continuing with this guide. Also see the Special Features Guide for information about Kiosk Mode, Secure Mode and other special EHS features. An incorrectly cased config file will be treated as missing or cause unpredictable results. 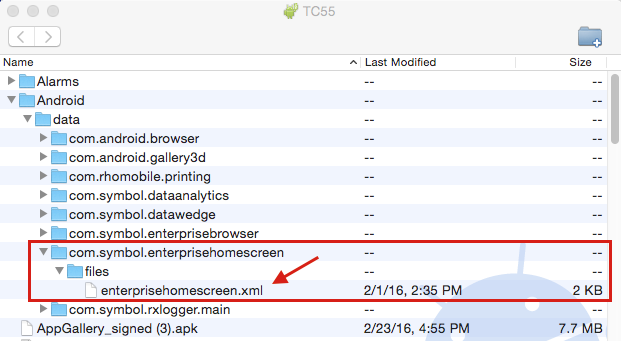 This section describes all tags in the enterprisehomescreen.xml file and their possible values. They're shown below in the same order they appear in the default file, and are followed by optional tags. Tags can appear in any order, but must be contained within the <config> </config> tag set. 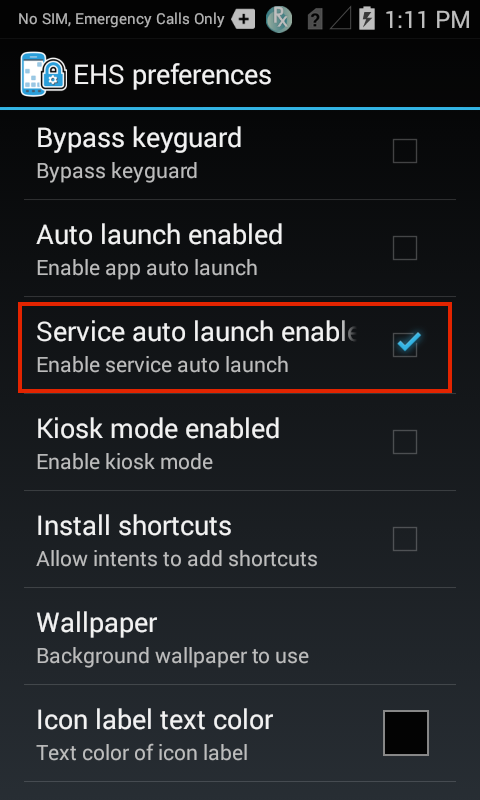 Specifies the app to run when the device is in Kiosk Mode, an optional mode under which a single app fills the screen and the BACK and HOME keys are disabled as a means of exit. Kiosk Mode is activated using the <kiosk_mode_enabled> tag in the <Preferences> section. Specifies the applications and/or browser links to be displayed to users while EHS is in User Mode. An optional activity parameter permits an app activity to be invoked when the app starts up. Some apps will not launch unless the app package and an activity are specified. Apps within each wildcard set will be listed alphabetically by label relative to other apps in that set. If the label is undefined in XML, labels of wildcard-selected apps will be applied to icons as they appear in the Android manifest (if undefined in the Manifest, app will appear with a blank label). Labels longer than 18 characters will be truncated at the 18th character and appended with an ellipsis (...). The wildcard character may appear only once per line and only at the end of the line. 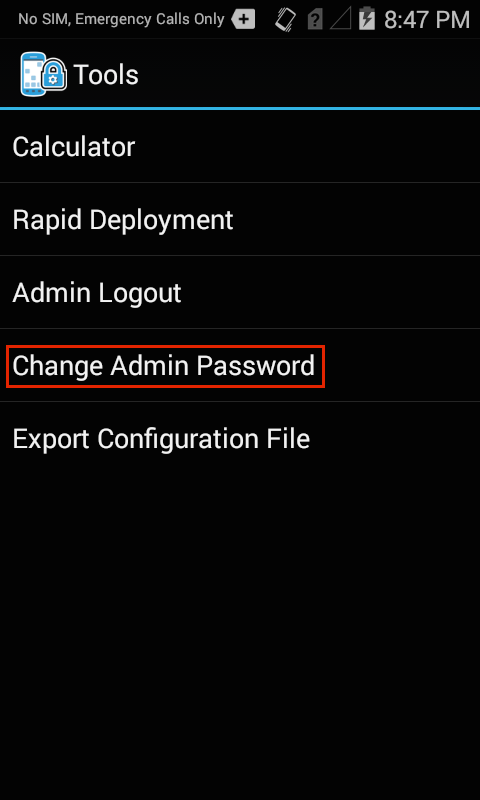 Stores the encrypted password for logging into Admin Mode (blank by default). Do not populate this tag manually in the config file or edit it in any way. The administrator password will be stored here programmatically by EHS after being entered or changed through the Tools menu in EHS Admin Mode. EHS uses this tag to store the password as a 256-bit AES-encrypted hash. Once a password is created and stored in the config file, it can be mass-deployed along with all other settings. In Admin or User Mode, tap the menu icon and select Icon settings: Icon size is accessible from Admin or User Modes and will apply to both. Tap on the desired icon size, then tap OK. Selected size is immediately applied. Medium (shown) is the default icon size. App icons can be displayed in five sizes; changes apply to both Admin and User Modes. Specifies the title bar text for the EHS app. 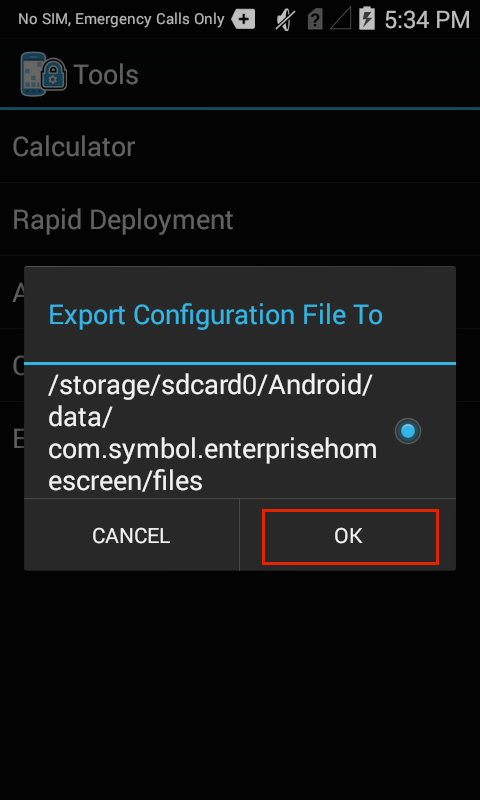 The default title "Enterprise Home Screen" can be changed to any string of characters. Controls whether an icon will be displayed in the Title Bar. A value of 0 (false) will allow EHS to display a custom icon. Allows an image to be specified for display in the EHS Title Bar. Supports .bmp, .jpg, and .png image formats of medium resolution (varies by device; some hi-res images might not be displayed). Image must be stored locally on the device and specified in the enterprisehomescreen.xml file or in the UI using the full path. Images will be scaled (up or down) using the aspect ratio of the image to fill the available space (which varies by device). Default EHS icon (shown below) will be displayed if tag is missing or left blank, or if the specified icon is missing or invalid. On Android L devices: screen orientation can be changed through the Quick Settings panel only when EHS is set to accept the System orientation setting (the EHS default). If an EHS administrator sets the orientation to landscape or portrait mode, the device user will no longer be able to change the orientation setting. Allows a background image to be specified for display in User Mode. If left unspecified, the system's default image will be displayed. Supports .PNG format files in the /enterprise/usr directory only. Resolution support varies by device. If a selected image fails to display, Zebra recommends scaling down the resolution or selecting a different image. EHS can be made to run in full-screen mode by setting the value of this tag to 1. Default is 0. Applies only to EHS; apps launched from within EHS will behave as individually designed. Will not prevent access to the Android Status/Notification Bar on some devices. See Disable Status Bar Settings to prevent user access to this feature in EHS. Causes the app specified in the <kiosk> section to be launched in full screen mode after EHS starts up and disables BACK and HOME keys to prevent users from exiting the app. Disabled by default. See also: Auto-Launch. 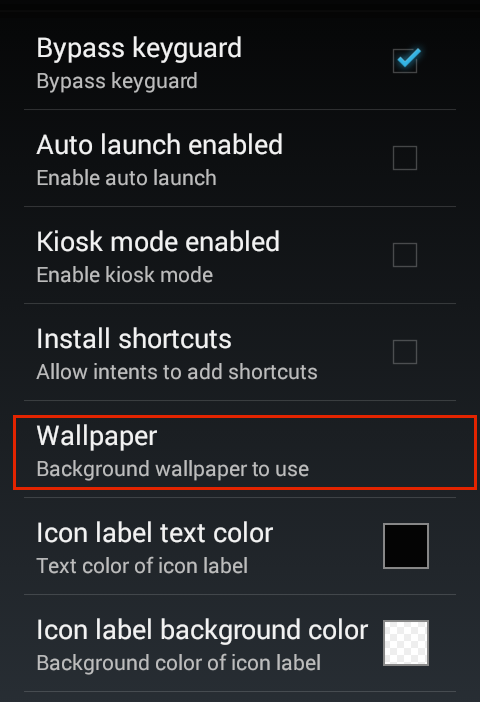 On Android L devices: Kiosk Mode should not be used with Screen Pinning, a feature in Android L that works in much the same way. 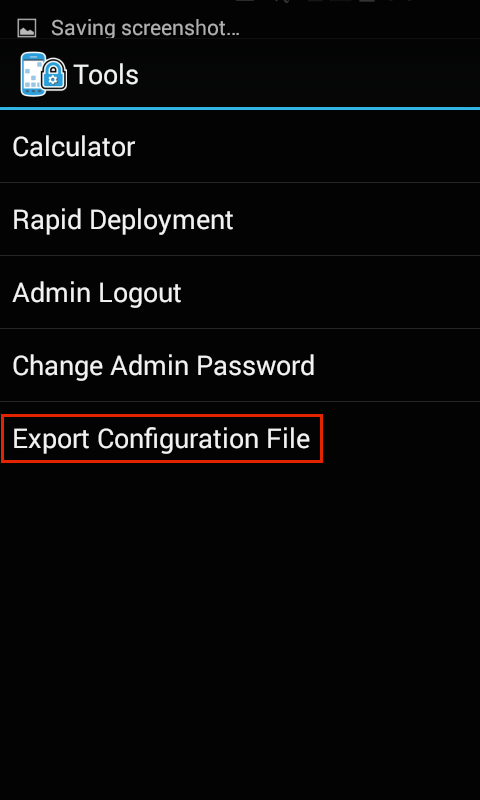 On Android L devices: A new feature in UI Manager allows the Status Bar Settings Icon (which UI Manager calls the Notification Quick Settings Icons) to be controlled through EMDK, StageNow or a third-party MDM system. 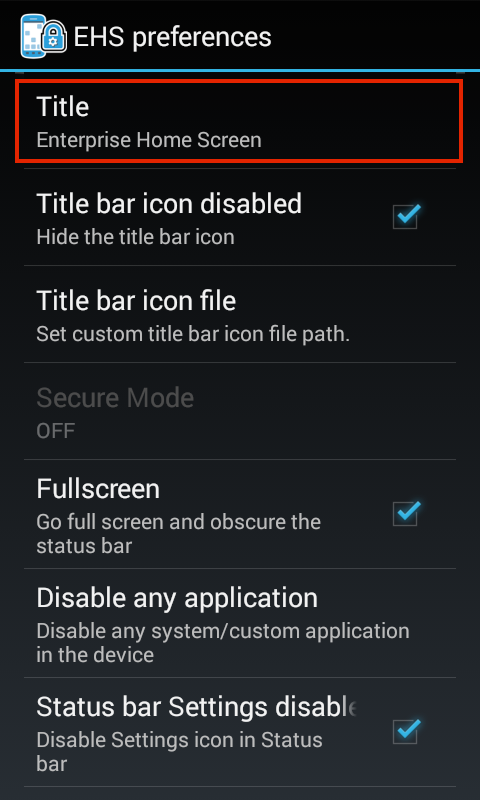 This will override any EHS setting for controlling the Status Bar Settings icon. Applies only to devices with MX 6.0 and higher, which is for Android Lollipop and later; any prior device limitations remain. 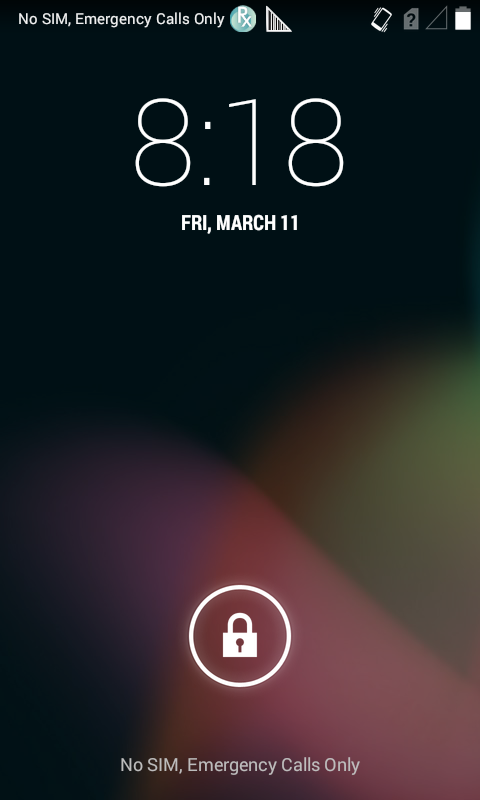 Controls whether the Android Status Bar can be pulled down to reveal controls and notifications. The Status Bar Pull-down is enabled by default. If this tag is omitted, contains a value of 0 or is left blank, the Status Bar Pull-down will be enabled. To disable, enter a value of 1. On Android L devices: A new feature in UI Manager allows the Status Bar Pull-down (which UI Manager calls the Notification Pulldown) to be controlled through EMDK, StageNow or a third-party mobile device management (MDM) systems. This will override any EHS setting for controlling the Status Bar. Applies only to devices with MX 6.0 and higher, which is for Android Lollipop and later. Controls whether the device can be put into 'airplane mode' from the Power menu or Quick Settings bar. Depending on the device, airplane mode can disable Bluetooth, cellular, Wi-Fi and/or other wireless radios and features. EHS blocks airplane mode by default or if this tag is missing or left unspecified. Enter a value of 0 to permit the device to enter airplane mode. 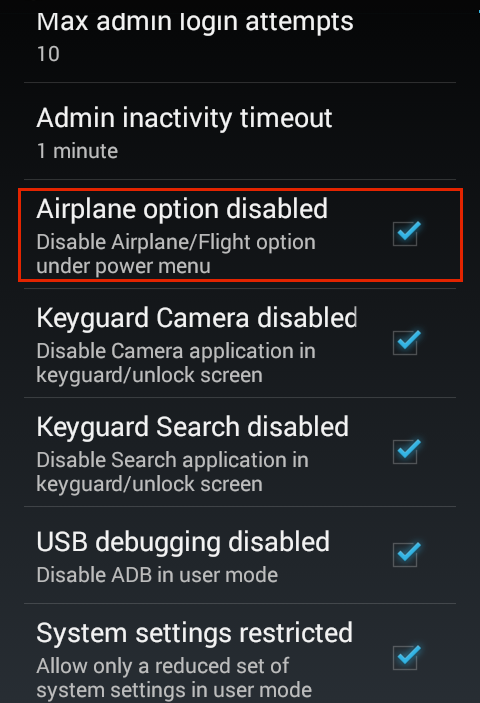 (Access to airplane mode from the Power menu is not available on some MC18, MC40 and MC92 devices running Android 4.4 KitKat. If this feature is greyed out, it might be possible to disable airplane mode on the device using PowerKeyMgr through Zebra EMDK or StageNow tools. On Android L: The Bypass Keyguard feature fails to unlock the screen after rebooting a device running Android L.
Note: On devices that employ MX Multi-user features, a setting of 1 for this tag will prevent the multi-user login screen from being displayed. Please see to important Security Notes involving interactions between EHS and MX Multi-user features. Controls whether the device camera will be accessible from the Keyguard screen (also known as the 'Lock Screen'). Applies only if the camera app is enabled on the device, the camera icon is visible on the Keyguard, and the Keyguard has not been bypassed using the <bypass_keyguard> tag; otherwise ignored. Camera access from the Keyguard screen is disabled if this tag has a value of 1 (default) or is left unspecified. Controls whether the Search app will be accessible from the Keyguard screen (also known as the 'Lock Screen'). Applies only if the search app is enabled on the device, the search icon is visible on the Keyguard, and the Keyguard has not been bypassed using the <bypass_keyguard> tag; otherwise ignored. Search access from the Keyguard screen is disabled if this tag has a value of 1 (default) or is left unspecified. To make use of this setting, the System settings app must be explicitly enabled in advance using the Enable/Disable Apps feature. This mode limits user access to certain features by preventing their display in the UI. 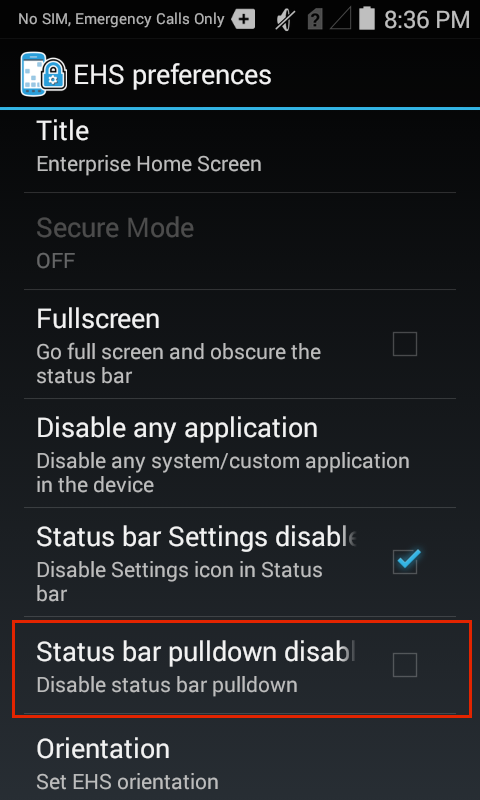 It does not block the features themselves; in some situations, Android makes restricted settings available to the user. For example, if the charge in a device battery becomes critically low, Android provides access to apps in the low battery warning display so they may be stopped, disabled or uninstalled. This can be prevented only by disabling the Settings app completely. With System settings restricted, it is still possible to add shortcuts to restricted System-settings components (i.e. apps) using a third-party shortcut creator. 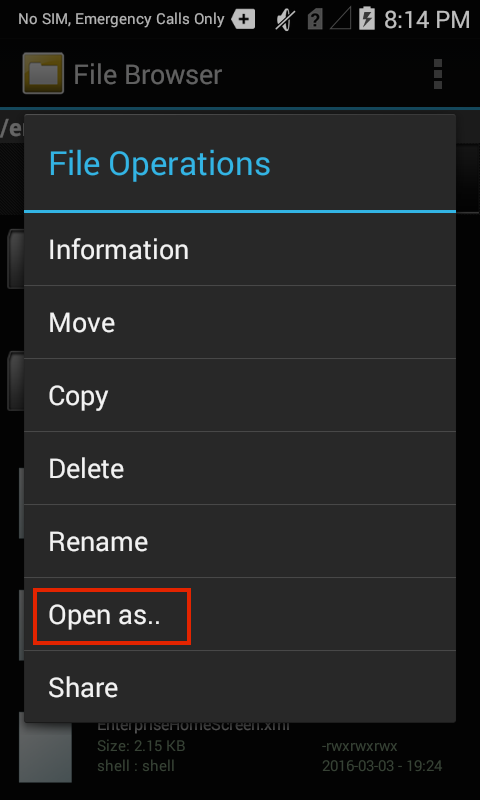 However, such shortcuts also will be available in User Mode. If a system setting component should be accessible only to administrators, it should not be mapped using a shortcut. Uninstalling EHS will not revert Restricted System Settings to its original state. If required, this must be done manually before uninstalling EHS. Permits any number of apps to be launched when EHS starts up. Similar to Kiosk Mode, auto-launch apps are specified in a separate section, can be launched with a specific app activity (optional) and the feature is activated with a tag in the Preferences section. Note: Package names may vary from one Android version to another. Permits a custom graphic to be specified in place of the system or default icon for an application or link when displayed on the User-Mode screen. Supports .bmp, .jpg, and .png image formats. 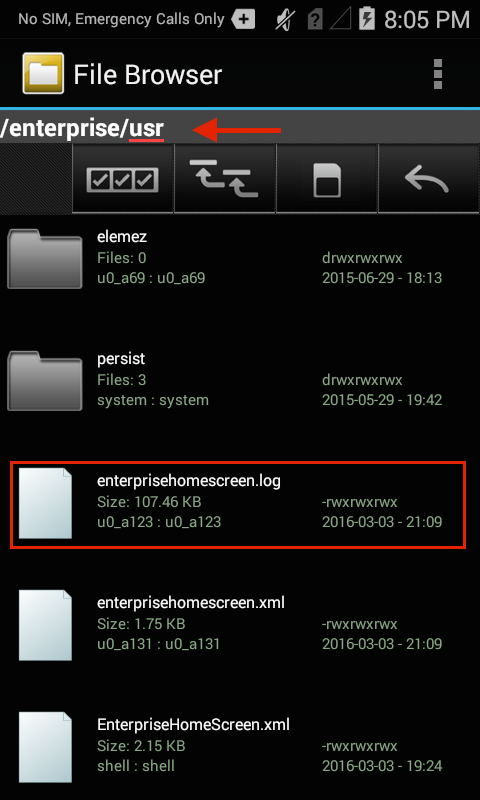 Image must be stored locally on the device and specified in the enterprisehomescreen.xml file using the full path. Default icon will be used if tag is left blank or specified icon is missing or invalid. 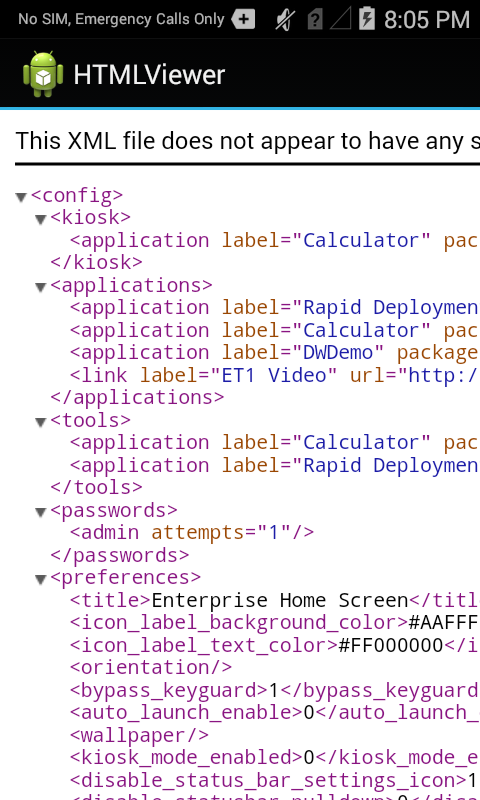 When used with apps specified using the wildcard attribute, all apps will display the same icon. Compatible with EHS Secure Mode. The number of failed attempts to log into Admin Mode before EHS disables Admin Mode login. EHS keeps a count of the failed consecutive login attempts with an attribute in the password admin node as in the Example Failed Login Counter below. The counter is reset if a successful login occurs before the maximum is reached. 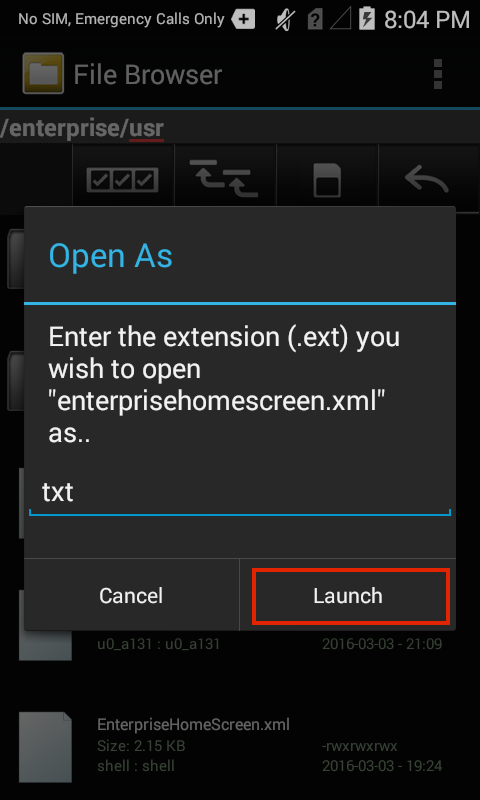 Once disabled, can be reset only by pushing a new enterprisehomescreen.xml file to the device. If this tag is not present or contains no value, the default of 10 will be used. Failed login attempts are added to the EHS log. Controls the time (in seconds) that a device will remain in Admin Mode without activity. Add this tag to the <Preferences> section to specify the timeout period. The default period is 60 seconds, which will be used if this tag is missing or left unspecified. Minimum period is 15 seconds (lower values will be ignored); zero or negative value disables timeout. The timeout counter runs only when EHS is in foreground, and resets when EHS returns to the foreground. Note: Use of the Android Search app has no effect on the timeout counter. See the Special Features Guide for information about Kiosk Mode, Secure Mode, Lockdown State and other special EHS features and behaviors.